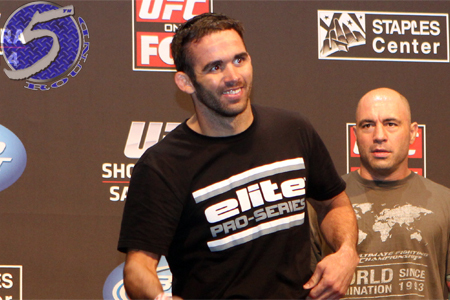 On Sunday, a lightweight scrap between Jamie Varner (pictured) and Pat Healy was added to the UFC on FOX 9 lineup. The December 14 event takes place inside Sleep Train Arena in Sacramento, California. Both fighters will be looking to bounce back from defeats. Varner dropped a split decision to Gleison Tibau in August at UFC 164. “C-4” has won half of his four bouts since returning to the UFC. Healy, meanwhile, was dominated by Khabib Nurmagomedov last month at UFC 165. “Bam Bam” was impressive in his big league debut, but his win over Jim Miller was overturned to a no contest after he tested positive for marijuana. The 155-pound affair will appear in the night’s prelims.